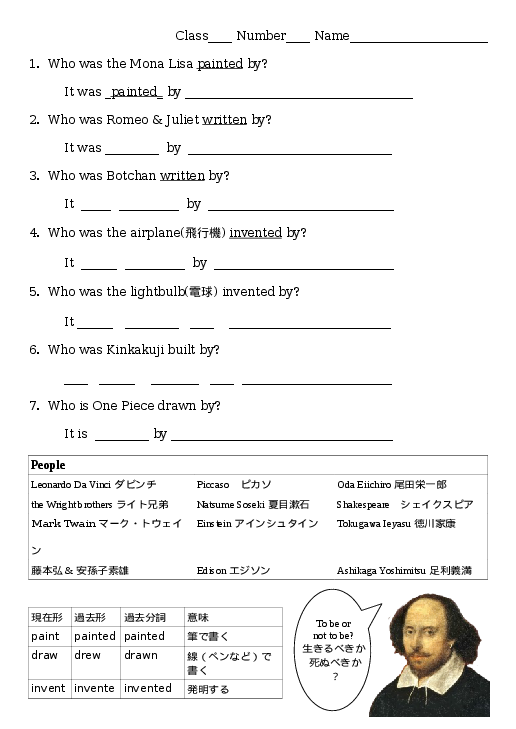 This is a worksheet where students fill in the blanks to makes sentences such a s "The Mona Lisa was painted by Leonardo Da Vinci." Give the worksheet to the kids and have them fill it out. You can read it aloud and do it together to make it a warm up quiz, or you can let them do it quietly as a cool down / end of class review. 1. Who was the Mona Lisa painted by? 2. Who was Romeo & Juliet written by? 3. Who was Botchan written by? 4. Who was the airplane(飛行機) invented by? 5. Who was the light bulb(電球) invented by? 6. Who was Kinkakuji built by? 7. Who is One Piece drawn by?